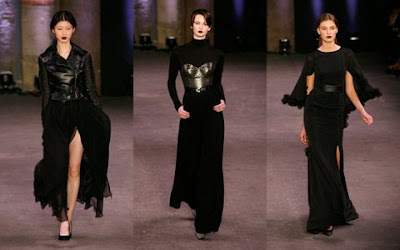 "Project Runway" designer Christian Siriano has really matured over the last couple of years in his design aesthetic. I had the pleasure of seeing his Fall 2011 collection at Nashville Fashion Week last year. I was completely in love with many of last years looks. With that said, this new collection stands shoulders above his previous, In both design and sophistication. The palate of grays, blacks, graphic prints and burgundy felt cohesive, and an almost black lipstick added an edge to the clothes' overall feel. His "girl" has definitely grown up. These looks in gray; almost white are bright, airy and give off a sophisticated style. I could see the first one for a lovely evening dining at 1808 Grille-Nashville. The second look is perfect for a night heading to Nashville's First Saturday Art Crawl. The third, is for that younger lady looking to head out to an event, such as The Champions for Change Luncheon in Atlanta. These next looks are adding beautiful color to the same sophisticated style. The first dress would be perfect for an evening heading to a Blumenthal Performing Arts Center performance in Charlotte. The second is a much more NYC look, especially since we in the south have not had a cold winter. Yet, I could see this making an appearance on the bolder southern lady. The third, could be paired with a fitted blazer and make its way into the office. Then lose the jacket after work and go out for a drink at Patterson House near music row in Nashville. These looks are some of the edgier in the collection. I love them! Making these work in the south, will definitely have heads turning. The first outfit with the leather jacket is for that edgy fashion forward girl who still wants to make it out to an upscale lounge like Mollie Fontaine Lounge in Memphis. The middle look with the gold bustier again is for a girl like the one previously mentioned. I could see them hanging out at the same events. The final look could easily be worn with the right accessories to The Grammy winning Nashville Symphony. Mr. Siriano of course did not completely leave out the stunning full gowns he is known for. He just has made them into a more chic style than before. The first gown is a very Siriano look, with the ruffled skirt. Unlike his previous collections though he managed to keep the ruffles more under control. The red dress is stunning. It would flatter many and make a statement at any event you attend. The third and my favorite look in the entire collection, is just beautiful. I know several ladies here in the south that would just rock that gown. 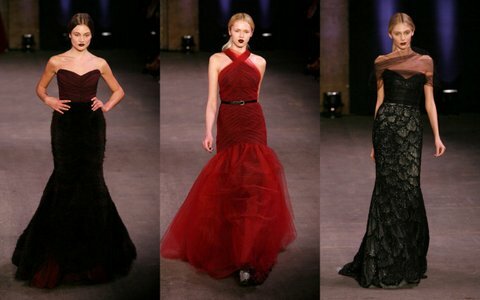 All three of these would be perfect for any formal event you find yourself invited to. I would love to see my favorite look at The 2012 Swan Ball at Cheekwood Botanical Gardens in Nashville. There were many more wonderful designs that hit the runway during the Christian Siriano show. I would suggest checking them all out. I look forward to seeing how much more this young designer grows over the next few years. I feel we have just seen the beginning.